"Don't forget your mittens!" Molly's parents warn her of this every morning but something always happens causing Molly (and many other children) to repeatedly leave their mittens behind at school! Until there are "Mittens, Mittens. My oh, my! 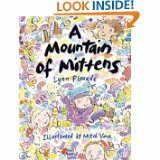 A Mountain of Mittens piled up high!" This book is full of hilarious antics and funny & colorful illustrations involving children and their mittens. The Lil Divas were in constant fits of giggles while I read it to them. The colorful illustrations of the numerous designs on the mittens in this story gave me the idea for our activity! This is great to practice those fine motor skills! I gave the girls a large pre-written template of both Upper & Lower Case Mm. I am following you from the blog hop. If you have a chance stop over at my blog and website and check it out. I look forward to learning more about you and your blog. New here from the blog hop. You have some great ideas! Adorable mittens! Thanks for following! I'm following back! Can't wait to see more of your blog! I'm a new GFC follower from Say Hi Sunday. I hope you'll check out my blog too!